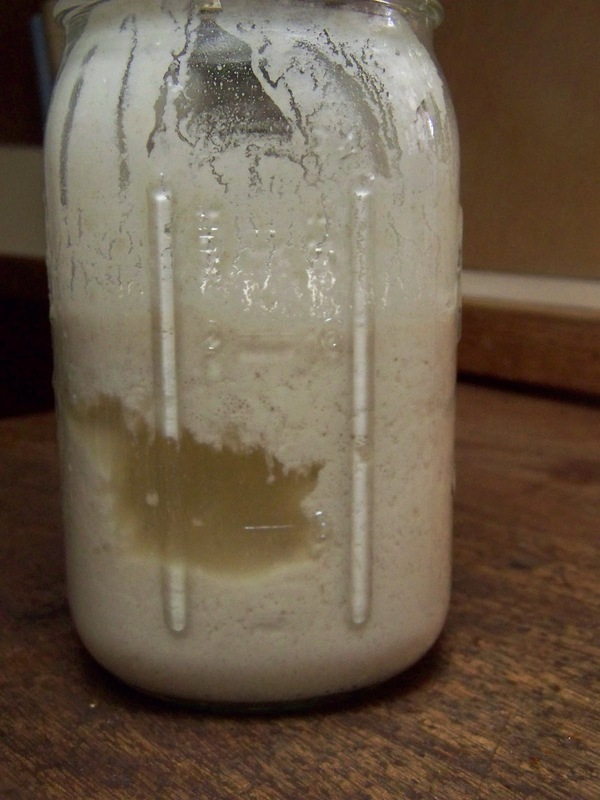 Most recipes I have found contain commercial yeast to make a sourdough starter. 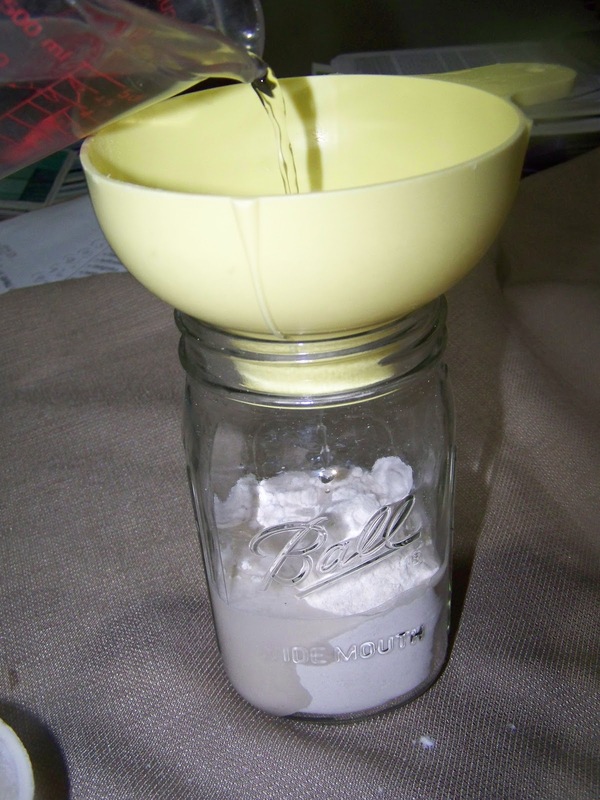 I love to try to do things the old fashioned way if possible so I searched until I found this method in Carla Emery's "Encyclopedia of Country Living". 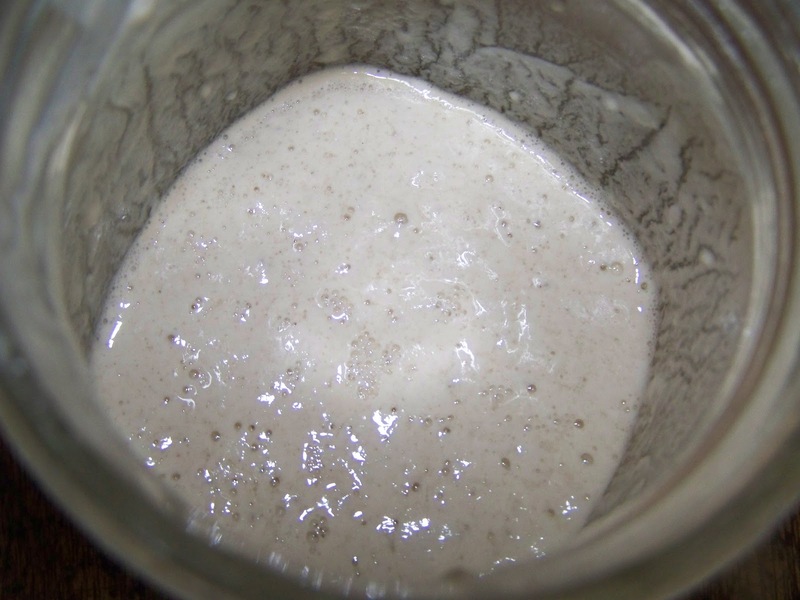 Sourdough is simply wild yeast that you've captured from the air around you. 1) Mix one cup of flour with one cup of water. Set, loosely covered in a warm place. 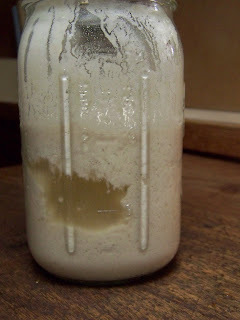 2) Check your starter daily. In one to three days it should begin to bubble. 3) It will begin to have a sour yeast smell. It will also have a darker liquid separate. Don't be alarmed - just stir it back in. 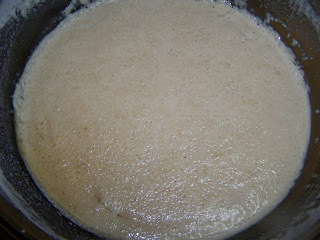 4) Mix starter with 2 cups of warm water and 2 cups flour. the beginning step to making your sourdough bread. let sit in a warm place until bubbly. 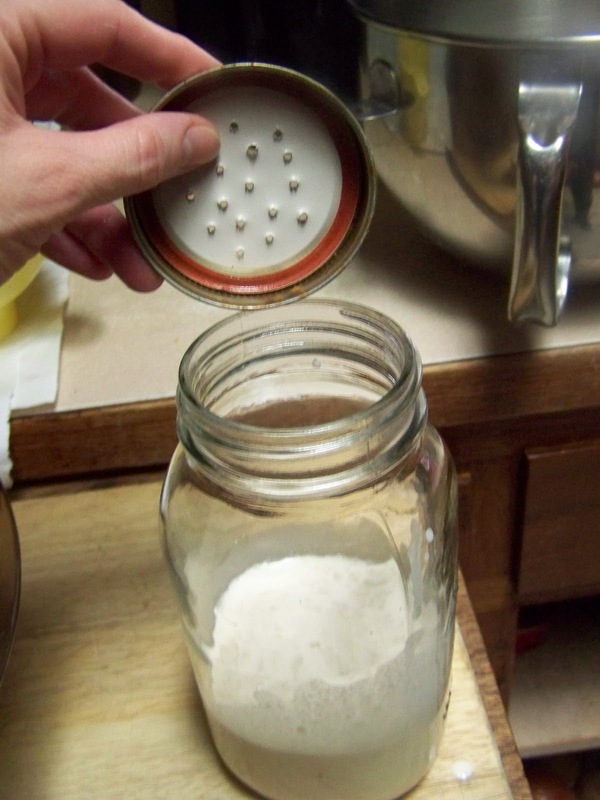 6) Save one cup starter for your next batch of bread. 7) Cap starter loosely. I poke holes in a mason jar lid for ventilation. Store in a cool location. 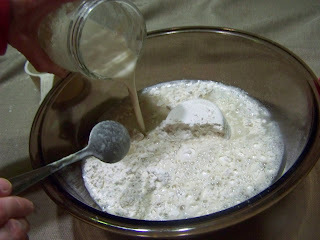 See Sourdough Bread Recipe for instructions to make sourdough bread. How long does the starter last? 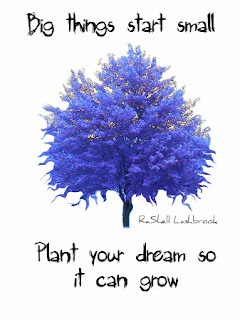 Or must you be perpetually creating loaves? While this does sound pleasant, it sounds like a 9-5 process. :) Need to get another oven to start this. Hmm, maybe I can take the essence of frugality and build a cob oven in the back yard instead. I had a starter that I managed to keep alive for 6 years! 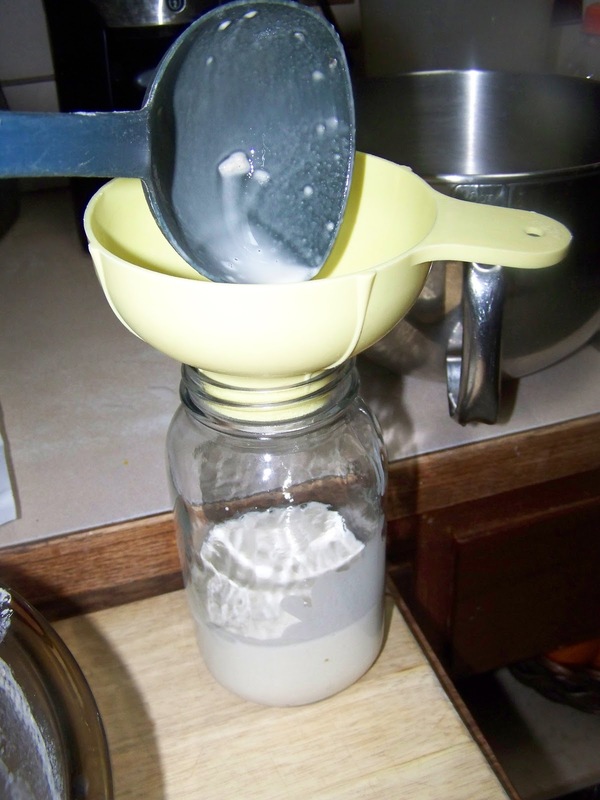 But, you must either feed it by making new bread (pouring your starter into the "sponge" gives the yeasties new food) OR just toss half your starter each week (you could give to a friend) and add 1/2 cup of warm water and 1/2 flour to feed your yeast. OK... I may have to try this. I actually seldom get to eat real bread because I have this bizarre allergy to commercial baker's yeast. But for some reason natural yeast, and therefore sourdough bread doesn't bother me. But I've always had a terrible fear of poisoning myself. Somehow, the idea of leaving this stuff out on the counter for days at a time makes me nervous. But you're clearly still alive, so perhaps I'll give it a whirl. So when you mix the starter into the sponge, how long do you wait for the sponge to get bubbly? Like are we talking hours or days? Regarding the time involved for the sponge to get bubbly after mixing the starter in - I generally mix it in just before bed and let it sit overnight, however, if your home is warm and you have an exceptionally lively starter, you could have a sponge ready within 3 to 4 hours. Hope this helps (in the unlikely event that you were still waiting for an answer YEARS later)! Thank you for raising a question that I'm sure other readers have had! Good Lord! 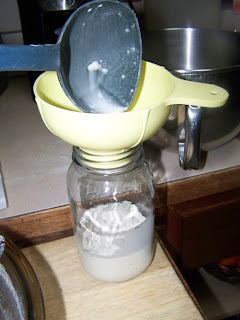 Maybe the sourdough did kill the writer..no reply comment in just over 3 years EcoCatlady! In all seriousness, thank you for pointing this out Anonymous. I had comments on different settings back then and realized that comments were slipping by me. Since then I've changed the settings so that I am notified when comments are made.